In the old days before Etsy, pricing was easy. You put your vintage item up for bid. The auction price was what it sold for. With the advent of set prices and buy-it-now, we must figure out prices for our items. How is that done for vintage items? 1. What is the demand for the item? Is its color popular? 2. What is its condition? For some types of items, condition is more important than others. 3. Is the item complete? Is it truly usable, or only displayable? Are the box and parts present? 4. Will the shipping add a tremendous amount to the final price? 5. How long can we wait to sell the piece? Can we easily store it and be patient to wait for our price? Or do we need to ask a lower amount to move the item quickly? Search Etsy for the item... check how your direct competition is pricing. Search the Internet for the item... in a broad image search you can see what is out there. Search eBay for the item... low end sold prices are visible when you check the box in the left column. Search Ruby Lane for the item... there we see more expensive pricing. For special types of items, there are more websites. For example, www.replacements.com can be helpful for china, glass and flatware. 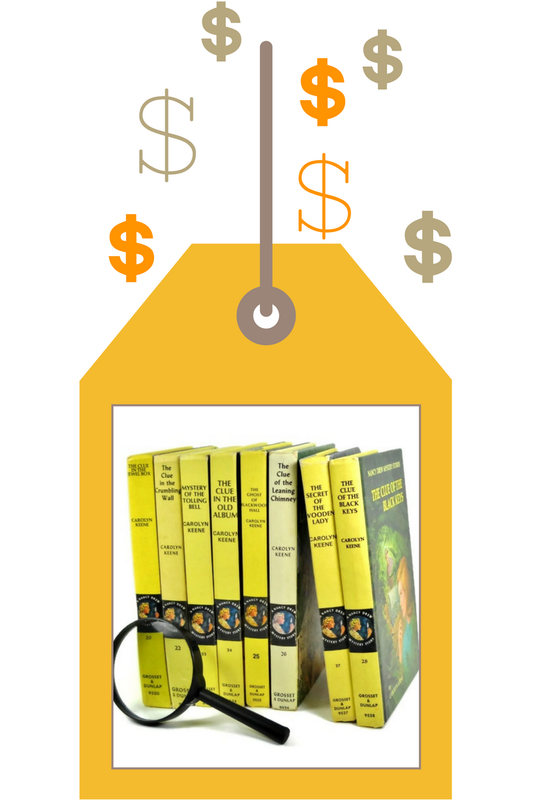 Amazon.com and AbeBooks work well for books. Consider what you have into the item. What did you pay for it? What kind of profit margin do you need? Can you factor in a 10-20% discount for coupons or those who ask for a better price? Take a realistic look at the piece. How does it compare with what is already for sale? What have similar items sold for? We must view our item within the context of the market and price it accordingly. If the item is priced at the bottom, shoppers may assume that something is wrong with it and pass it right by. If we shoot for the moon, the high price could also turn off potential buyers. I picture myself shopping. I make a search and see a page of results. I filter as to price. Which item would I choose based on the selection? However, not everyone shops that way. This brings up the questions of who are our buyers, and how do they shop? Pricing goes hand in hand with marketing and branding. are we the cheapest or best? I took a marketing class many years ago. My takeaway was that you can market yourself as either the cheapest or the best. Given the choice I try to market myself as the best... but with more moderate pricing. That is because my Etsy shop has a bit of a primitive Maine theme. Niche shops can add a bit to their prices in general. Vintage sellers who specialize can attract more repeat buyers. They have less overall research to do. Here is more information why specialization is a good idea. How do we attract better buyers? Most of us would rather market toward upscale buyers. They are willing to pay more, right? 1. Make your shop look complete with everything filled out, your about page, banner, avi, etc. 2. Photograph your items well. 3. Have interesting items that appeal to upscale buyers. 4. Emit an aura of quality. To whom are we marketing our items? Who is our target audience? 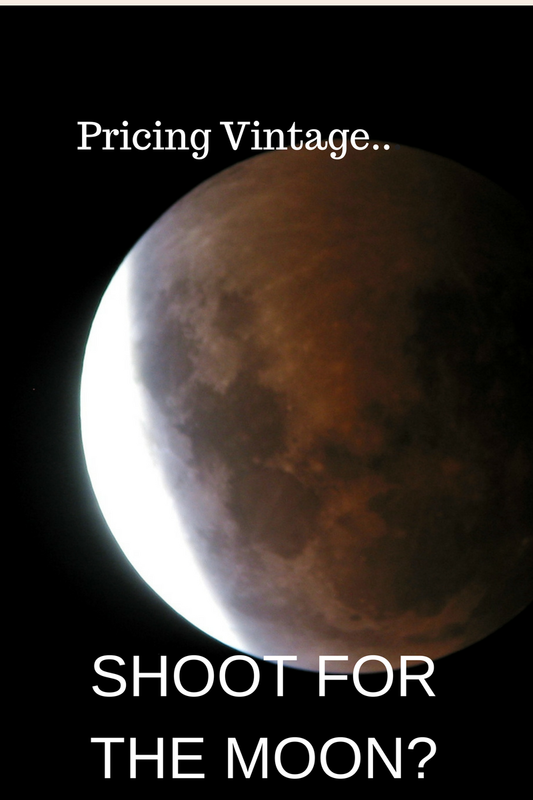 Here are some more ideas for raising the bar for your vintage shop. If the item is rare, you can price it higher. However, there has to be enough demand for it so that someone will want to pay the price. As vintage sellers, we must pay heed to trends in design and fashion. If there are a lot of the item already for sale on Etsy, I tend to price mine toward the bottom. That is how I handle the issue of direct competition based on price. 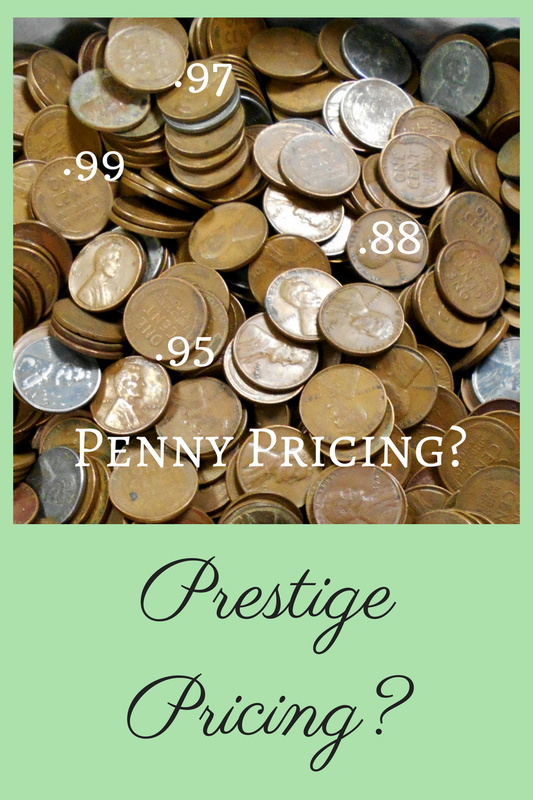 pennies or whole dollar increments? When you go shopping, take notice of prices. Upscale stores usually round to whole-dollar amounts. 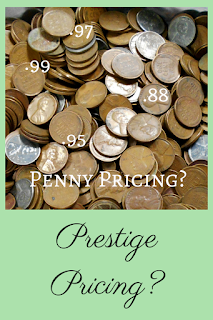 Discounted pricing usually end with penny amounts like .95, .99, .88 and the like. If we are marketing to upscale buyers, then round to whole dollars. If we aim to be the cheapest, then use "discount" price points. My own take on price points? On the other E where it can be a race to the bottom, I use .95. On Etsy, I use whole numbers. The exception? Items in my bargain section are generally priced with the .99 ending. How comfortable are you with pricing your vintage goods? Do your prices reflect all of your costs including time and effort? 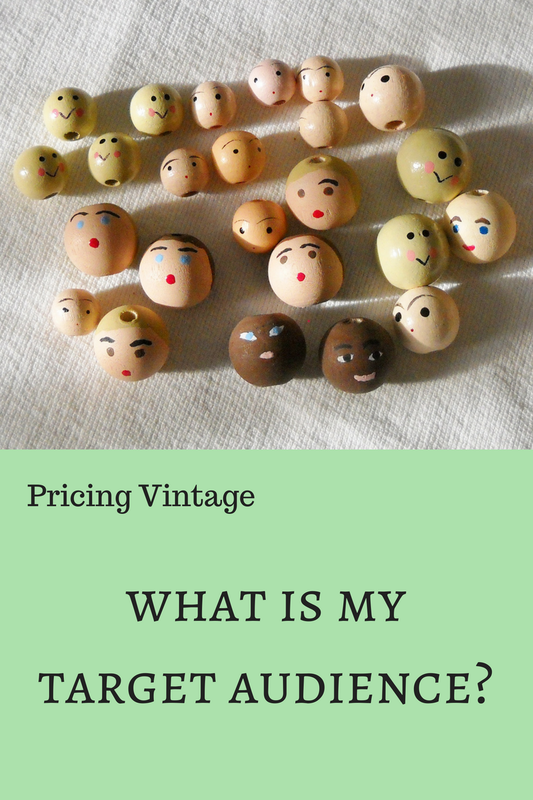 What tactics do you use when setting prices on Etsy? Wonderful article, Joanne, and so full of information. Headed back through to click on the links and read more. This is great advice here, for handmade as well as vintage sellers. As an artist pricing is difficult, its necessary to be competitive, but not if it means undervaluing yourself. Joanne, You always do such a nice job. Your blog is a good read. Thanks for the info. Your questions engage one's thinking . . .
Great advice Joanne. 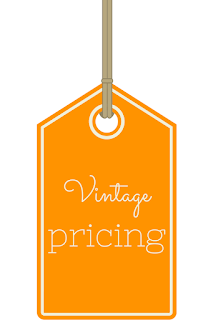 Pricing can be tricky, and it is amazing the difference the venue makes, as well as the presentation of the item. An item on First Dibs could be priced hundreds of dollars more than the same exact item on etsy or ebay. I always try to stay aware of those who I think are really more collectors than sellers. They have items at really high prices, that if the item sits for years or never sells they are fine with that. I tend to look at ebay completed items to see what items have actually sold for, then see what the competition is on Etsy, pricing as well as how many other of the same or similar items are listed.